At Regional Hospice and Palliative Care (RHPC)’s Center for Comfort Care & Healing (CCCH), Tuesdays and Thursdays are widely known as “Louise Days”. This is thanks to volunteer Louise Burnette, whose sweet treats bring delight to all who taste them. Visitors to the Center for Comfort Care & Healing quickly learn that 3:00pm is the magic hour. This is when the kitchen staff lovingly puts out a “high tea” of cookies, brownies and other baked goods for patients and visitors to enjoy. Since opening 3 years ago, in addition to the superb clinical care that patients receive, high tea has become a visitor favorite and it can largely be attributed to volunteer bakers like Louise Burnette. In 2015 when the Center was opened, Louise Burnette signed up to volunteer as a lobby greeter, welcoming patients and visitors to the Center. As word got out that the Chefs were open to volunteers helping in the kitchen, Louise’s love of cooking and baking drove her to transition into this role. Having previously worked in a bakery and bread shop for six years, Louise was no stranger to a commercial kitchen. She quickly found her groove, and the Chefs welcomed her – and her skills – warmly into the kitchen. As the Chefs got to know her, Louise’s knack for baking made it clear that she was the perfect one to do much of the center baking. Her bakery experience enabled her to make large quantities of baked goods, while maintaining the highest quality. She also introduced some of her own recipes into the kitchen, diversifying their repertoire, while continuing the classics that the Center had become known for, like brownies and gluten-free peanut butter cookies. With two grown children out of the house, Louise also seized this opportunity to try out some new recipes that she found. In anticipation of her volunteering, she began to bake new recipes and bring them in for instant feedback from the patients, visitors, volunteers and staff. The decadent treats are regularly received with universal accolades – and her full trays of baked goods are picked empty within minutes of the word getting out that they’ve arrived. 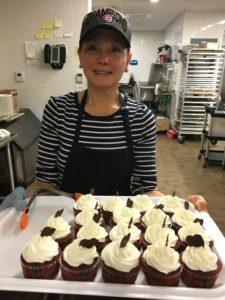 An extremely modest person, Louise always reassures people that he recipes are “really easy” and “no big deal” – but CCCH Executive Chef Jon LeFebvre raves that Louise is better than many of the trained pastry chefs that he’s worked with and that her baked goods are of professional caliber. Other volunteers sign up to come in specifically on Tuesdays and Thursdays just to try out Louise’s latest creations – from German chocolate cake – to individual cheesecakes – to truffles – to individual key lime pies. Everyone has their favorites, but you would be hard-pressed to find something you don’t like. For Louise, the best part of her volunteering is the appreciation that she feels. While she’s behind the kitchen window, family members and patients often come up to her to thank her for making such a special treat. It means a lot to her knowing that it meant a lot to them. Adding another dimension to her repertoire, Louise is also a skilled vegan baker, as both of her children observe vegan diets. This comes in handy when hospice patients have food allergies or intolerances. In one of many such instances, a patient was celebrating her birthday at the Center and could not have dairy, which presented a challenge in making a birthday cake for her. Louise went home, found that she had Vegan butter, and rushed out of the house first thing in the morning to meet the kitchen staff as they opened so she could give them the vegan butter and the patient could celebrate her birthday with a vegan chocolate cake. The patient’s mother later wrote a note to RHPC thanking them for the exquisite care that her daughter received and mentioned the impact that that chocolate cake had on her daughter, which she said she would never forget. In typical Louise fashion, she downplays her role in creating this beautiful memory and is just happy that she could do it. When asked about her favorite recipes to make, it’s not surprising that they are the ones that remind her of loved ones. Her German Chocolate Cake that she adapted from her mother’s recipe and the pecan bars that her neighbor brought her after Louise’s husband had a hospital stay are near to her heart. Baking them reminds her of these people dear to her and their kindness. She also loves making her kids’ favorites: peanut butter balls for her daughter and oatmeal-chocolate-chip bars for her son – vegan, of course. Louise talks about how much she enjoys working with the Chefs, who she describes as very professional and so very kind. She marvels thinking about how much gratitude she receives from the staff, the other volunteers and the visitors for doing something that she loves to do. The positive reinforcement she gets regularly makes it easy for her to come back week after week. So if you ever find yourself at the Center for Comfort Care & Healing at 3:00pm for “high tea”, as you bite into your delicious coconut macaroon or oatmeal raison cookie, know that the love and kindness of volunteers like Louise are the secret ingredient in every bite. 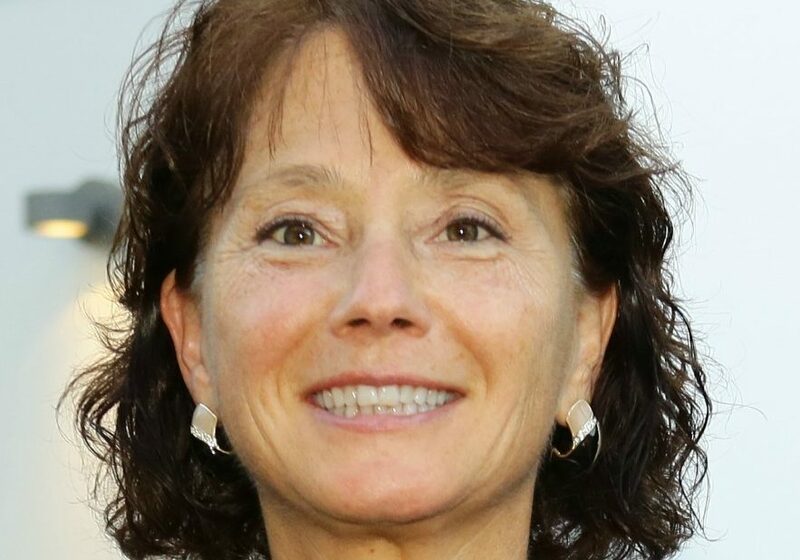 Louise will be honored at the Danbury Leadership Breakfast this May. Find out more information here!